TensorFlow Model Analysis (TFMA) can export a model's evaluation graph to a special SavedModel called EvalSavedModel. (Note that the evaluation graph is used and not the graph for training or inference.) The EvalSavedModel contains additional information that allows TFMA to compute the same evaluation metrics defined in the model in a distributed manner over a large amount of data and user-defined slices. eval_input_receiver_fn must be defined and is similar to the serving_input_receiver_fn for estimator.export_savedmodel. Like serving_input_receiver_fn, the eval_input_receiver_fn function defines an input placeholder example, parses the features from the example, and returns the parsed features. It parses and returns the label. # points to the input placeholder. labels can also be a dictionary. Useful for a multi-headed model. The eval_input_receiver_fn function will, most likely, be the same as your serving_input_receiver_fn function. But, in some cases, you may want to define additional features for slicing. For example, you introduce an age_category feature which divides the age feature into multiple buckets. You can then slice on this feature in TFMA to help understand how your model's performance differs across different age categories. TFMA can perform large-scale distributed evaluation of your model by using Apache Beam, a distributed processing framework. The evaluation results can be visualized in a Jupyter notebook using the frontend components included in TFMA. # Note that this code should be run in a Jupyter Notebook. # tf.parse_example in your model. 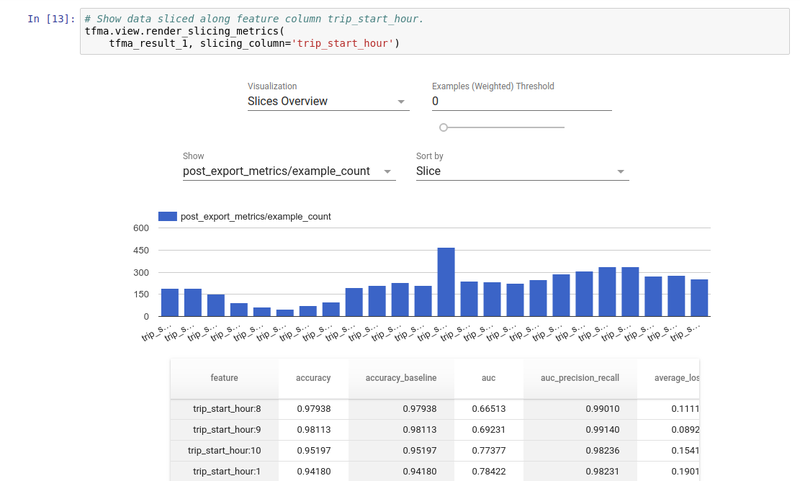 Compute metrics on slices of data by configuring the slice_spec parameter. Add additional metrics that are not included in the model with add_metrics_callbacks. For more details, see the Python help for run_model_analysis. # To run the pipeline. # You can change the source as appropriate, e.g. read from BigQuery. # To load and visualize results. Try the extensive end-to-end example featuring TensorFlow Transform for feature preprocessing, TensorFlow Estimators for training, TensorFlow Model Analysis and Jupyter for evaluation, and TensorFlow Serving for serving.